You are currently browsing the category archive for the ‘raku’ category. No, we haven’t fallen off the planet, just everywhere but the keyboard. Here are a couple of shots of some raku pots I snapped at a show this weekend. 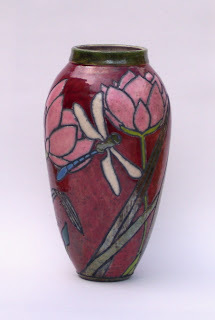 Stylized dragonflies and lotuses bottle & a sweet bay magnolia jar. Other news.. this spring’s last First Saturdays Art Market will be at Cathedral Square in downtown Mobile on June 2nd from 9 am to 3 pm (NB relocated from the Royal & Government location). There will be pottery and painting demonstrations, and starting at 7:30 am on the other side of the square will be Mainstreet Mobile’s Market on the Square farmer’s market. Hope you are able to join us as we go out with a bang. 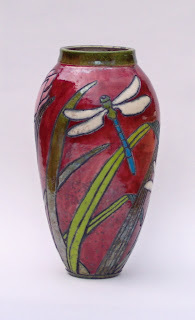 The only pictures of designed raku pottery I’ve had up on the blog have been finished ones. I thought it might be kinda cool to see what these pots look like in their raw state. Here are a few I’ve been working on that are still very much in progress. 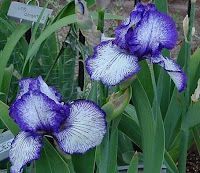 One has an iris design and the other, bay magnolia. After studying a subject, whether it be a peacock feather or a particular flower, and making my sketches, I visualize the design layout then carefully carve it into the surface of the “leather hard” clay. 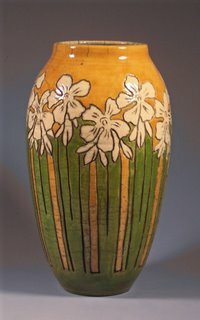 Carving a design into clay is much different than drawing or painting it. The positioning of the tool initially can be tricky and carving, like anything else with pottery, takes practice. 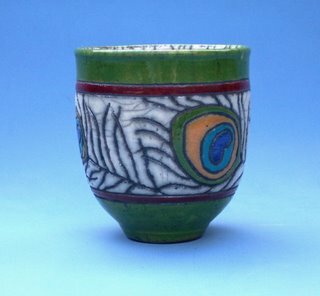 After you spend all that time and effort making that pot — throwing, trimming, and waiting for the clay to be just the right consistency– you have a lot invested and you don’t want to mess up. Once you lay your tool into the clay and make a cut, there is no going back or correcting it, so extra care needs to be taken. 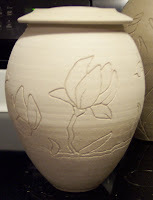 After the carving is complete, the pot is left to dry usually for about a week or until it is “bone dry”. It is then bisque fired, glazed, then fired raku kiln. 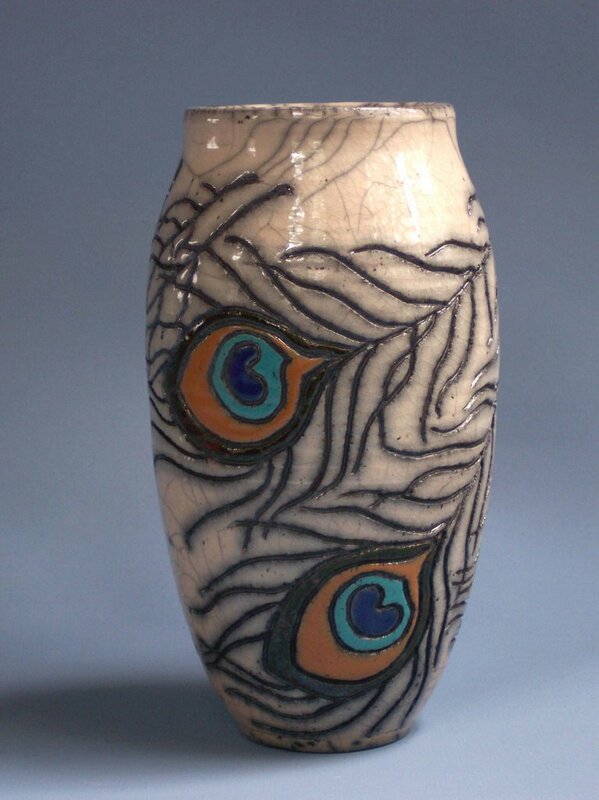 (Please see my post from July 18th for a description of the raku process). I will try and post pictures of these pots again once they have been glazed and fired. 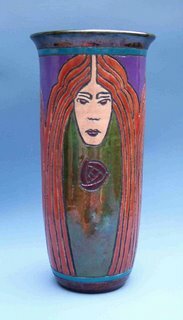 If you would like to see more raku pieces, please visit our web page and click on the “Original Art Works” section. 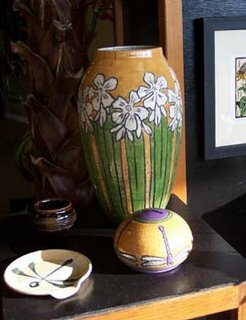 In the past few months, I’ve posted pictures of some of our pottery here on the blog and on our web site, now here is a little info about it. 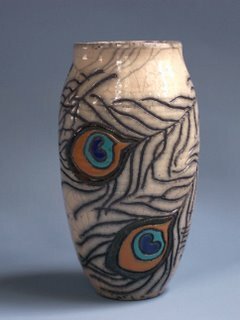 All our raku vessels, are individually formed, carved, brush-glazed, and fired, using an American variation of the Japanese firing technique known as raku. A glazed pot is heated to approximately 1825 degrees Fahrenheit. Its then taken from the kiln while its still red-hot, gently placed in a bed of pine shavings, and then covered (as you can see in this picture, we use a wheelbarrow or on other occasions in a metal wash tub as our pine shavings receptacle). When the oxygen in the air surrounding the pot is depleted by the flame, the flame then looks to the glaze for more oxygen molecules to consume. 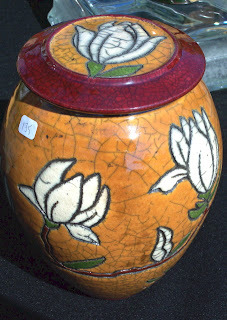 A chemical reaction may take place in the glaze, causing spontaneous and random flashes of color and metallic lustre. As the pot cools, a random crackling (or crazing) of the glaze occurs as the clay and the glaze expand and contract at different rates. What also happens is the carbon from the burning shavings fuses to all the unglazed surfaces and cracks in the glaze, turning them black. The piece, still hot, is then extracted from its bed of shavings and is quenched (or rapidly cooled) with water. Doing so not only cools the pot to the touch, but sets the colors before theglazes have a chance to reoxidize. Some of the results can be quite spectacular and its easy to understand the allure of pottery fired in this way. No two peices ever turn out completely the same and every one, in its own way, is one-of-a-kind. The majority of stoneware clay we use for our functional pottery is from abundant native Alabama clay deposits, usually found within just an hour’s drive of the studio right here in Baldwin Country. The deposit Lowell working on here is right along a local roadside. The clay that seems to work best is whitish or, better yet, almost a bubble gum color. It fires the highest and has the least amount of impurities which is perfect for durable functional ware. 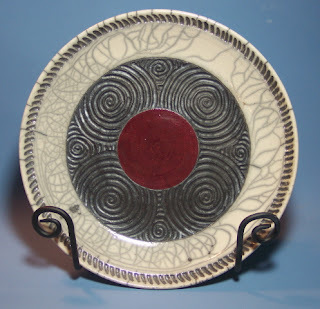 Our functional pottery is individually formed, most of it on a potter’s wheel, is individually decorated, and then high-fired in a propane fueled gas kiln to approximately 2400 degrees Fahrenheit. This afternoon I made a trip down to Tino’s Fine Art & Frames to deliver a few pots and was really impressed by all the new work that is on display. The gallery is looking FULL. Rick was busy hanging and arranging work and making the last minute preparations for his official Grand Opening & Memorial Day open house this Saturday from 2 – 8 pm. The public is welcome to come out, enjoy the art, and meet the artists. Refreshments and nibbles will be served. I was excited to see that there are three new artists who now have work in the gallery. Talis Jayme (watercolors, acrylics, & pastels), Gary Reynolds (Fractal Art), and Erik “Turtle” Olsen (Metal work sculpture). In addition to the open house, the neighboring Sunset Cork Room will have the wonderful Lisa Zanghi providing their live entertainment that night. So come out and finish the day off with some flair. Hope to see you there! 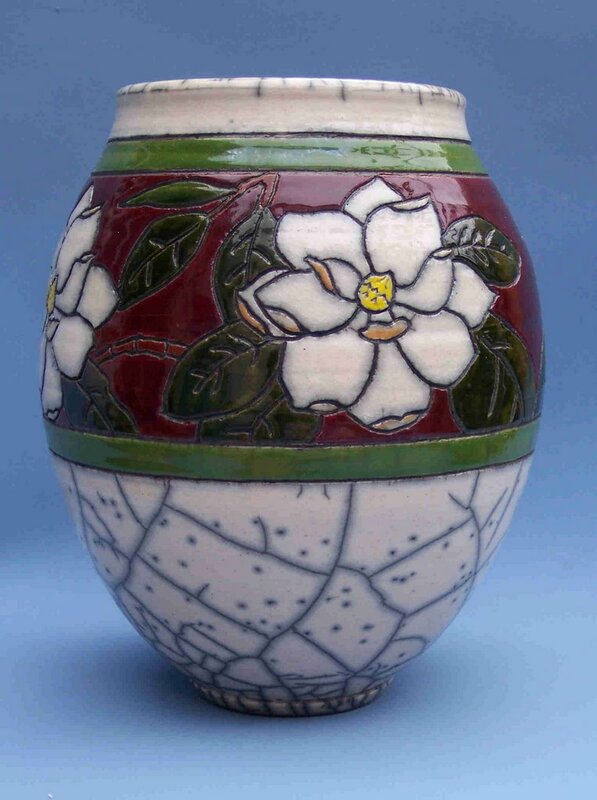 Come and see us, Anne & Lowell of Webb Pottery at “Art in the Park”, Foley, Alabama, May 13-14 (mother’s day weekend). We will have mostly our functional stoneware pottery made from native clay, but also plan on having a few art pieces, and some of new Lowell’s pit-fired wall plaques. Orange Beach Art Center website. Also don’t forget to check out the article on Rick Tino and the Tino Frame and Fine Art Gallery in Gulf Shores on p. 36 & 37 of this month’s The Pelican, a weekly community newspaper for our part of the Gulf Coast. Rick will be holding a gallery open house on the Saturday of Memorial Day Weekend, where you can see first hand work including stained glass, funky folk art, pottery, painting, and some really wonderful blockprints and handmade raku tiles. More news to follow on that, but don’t forget to mark your calendars! Hope to see you there! Last weekend we took a ride down to Gulf Shores, to check out and take work to Rick Tino’s new gallery, Tino’s Fine Art & Frames. Rick, who lives in Gulf Shores, has been dealing with various frame shops and galleries in the area for years. He noticed that increasingly these places have been gravitating toward selling mainstream art, prints and work that one could find anywhere else. 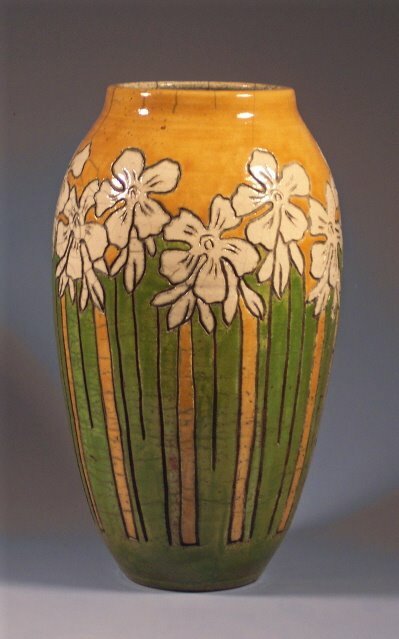 Rick has invited artists who he feels would help him achieve his vision, offering an eclectic range of work from quality functional pottery to one-of-a-kind two- and three-dimensional works of art. 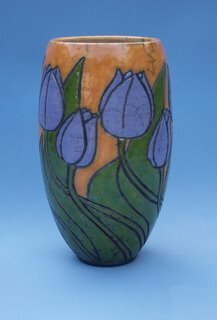 Featured local artists are Laura Hensley(Glass), David Atwood (Glass), Chris Hartsfield (Realism Painter – Watercolor & Giclee Prints), Tommy Cannon (Oil) , Sea Oats Studio – Steve & Dee Burrow (Stoneware Pottery), Wilodean Brown (Pencil, Pen and Ink), Anne Webb & Lowell Webb (Stoneware, Raku, & Primitive-Fired Pottery), and Rick Tino (Acrylic, Watercolor, Gouache). Feel free to contact Rick for more info, directions, or better yet, drop by when you’re in the area!